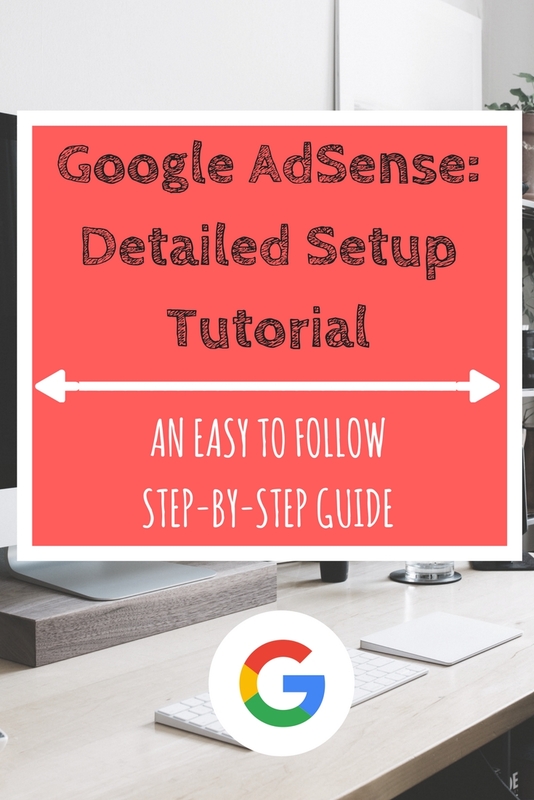 Ever wanted an easy, step-by-step, guide to Google AdSense setup? Then today is your lucky day! I’ll show you how to setup AdSense 2different ways for WordPress. So, no matter your situation, you can find a way to easily monetize your blog! 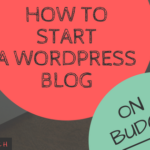 Whether you started your blog or website with the intention to monetize or not, you’re most likely reading this because you’ve decided you’d like to give it a try. If you’re not too familiar with coding or the backend of website design and setup, this could seem a daunting task. Not to worry though, I’m here to walk you through a couple simple ways to get Google AdSense setup on your WordPress website in little to no time at all. I’m going to be going through the 2 easiest methods I’ve used on my own website, as well as some of my client’s sites. 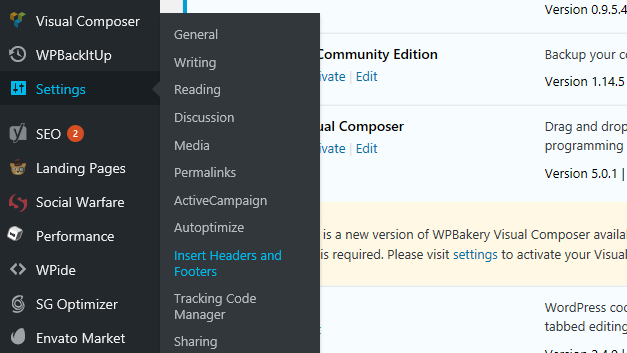 These options are incorporating the code either using a WordPress plugin, and using certain settings within your theme (if it allows for integration). To get Google AdSense setup, you’ll need to paste some code into your site so that Google can verify the ownership of your domain. You’ll also need to paste the code of the actual ads you’ll be using onto whichever section of your site you’ll want to display them. You can choose to place them in either the header or footer of your websites, the sidebar, or throughout posts and pages. The options are limitless. 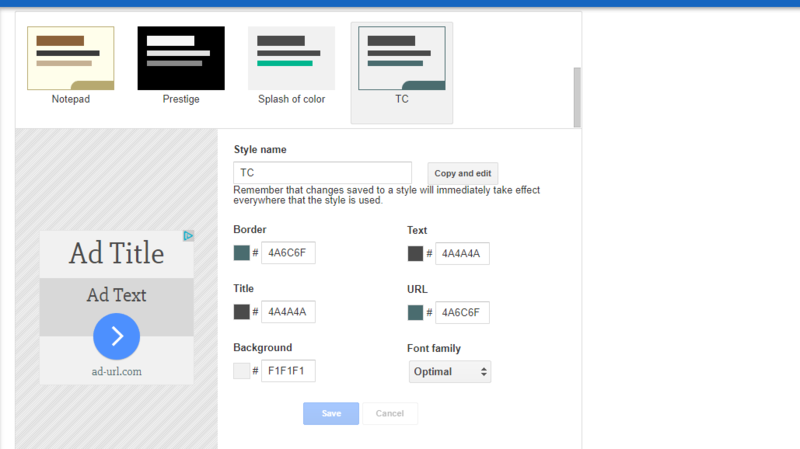 Side Note: I’ve also used the theme editor in the dashboard to connect adsense but that method is a little more involved and I wouldn’t recommend it for a novice or beginner because one misclick can easily cause an issue. We’ll keep it simple here and try and get Google AdSense setup for you in as little time as possible! Google AdSense is an ad program, run by Google, that allows you to display ads from different companies. The best part- they pay you for it! AdSense pays for impressions and clicks on the different ads displayed throughout your website, so the greater your traffic, the more you can make. In order to make a decent amount of money with AdSense, you’ll need to be getting vews from visitors in the range of at least the thousands. This might seem like a bit much when you’re first starting out but if you focus on creating a good amount of quality content on your website, and promoting it through social media, you can achieve this! You may ask yourself why you should use Google AdSense. Yes, there are other companies who offer similar services of paying you for displaying ads on your website. I recommned Google to my clients and friends for a few reasons. I don’t think I’ve ever come across someone who hasn’t heard of Google. They have a range of different products, specifically those related to running a business or website, like their Keyword Planner- which is a staple in my keyword research for my blog topics. 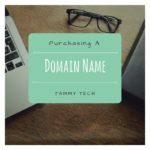 They also have handy things like Gsuite which allows you to easily create and manage an email address for your domain, like my hi@tammy.tech! Another wonderful feature is their adaptive ads. You are able to customize what type of content you are, and aren’t comfortable displaying. For example, you can get paid more for allowing 18+ content on your website but have the option of disabling that, and many other categories if you feel they aren’t relevant. AdSense also crawls your website and looks at what type of content you have displayed on your blog and shows ads that are relevant, and would appeal to people reading your posts! Google is wonderfu at integration in so many ways. Not only with how you can incorporate them- such as in the sidebar, in posts, or even in the header or footer of your blog, but also just using the service. They allow you to connect multiple websites to one AdSense account making it easy and convenient to manage all your information in just one place. 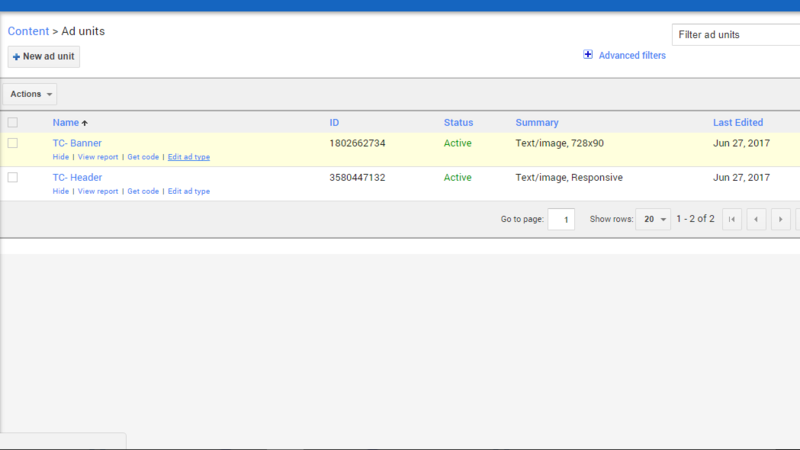 You can also customize which types of ads you want to allow for each individual website. Their versatility never ceases to amaze me! I’ll try to keep this brief as Google will sort of walk your through the steps as you complete the process. First, you’ll need a gmail because Google requires one for you to sign up with. Either use an existing gmail, or create a new one. After you sign up they’ll ask you to copy the provided code “between the “head” and “head” tags of your homepage. This is where you’ll incorporate either of the methods I’ll outline below. After they’ve confirmed the code is setup properly, they’ll ask you to set up payment address, and provide a phone number. If everything has gone okay up to this point and they approve your application, then you can begin implementing ads onto your site. Your account can be denied for any number of reasons. Most commonly I’ve seen it happen because of a lack of content, so don’t be too eager to try and monetize. Make sure you have a decent number of posts, or meaningful content or you could be denied and have to wait and reapply at a later time. This is pretty much the most universally simple way to connect AdSense to your website. Oh, the joys of WordPress plugins! 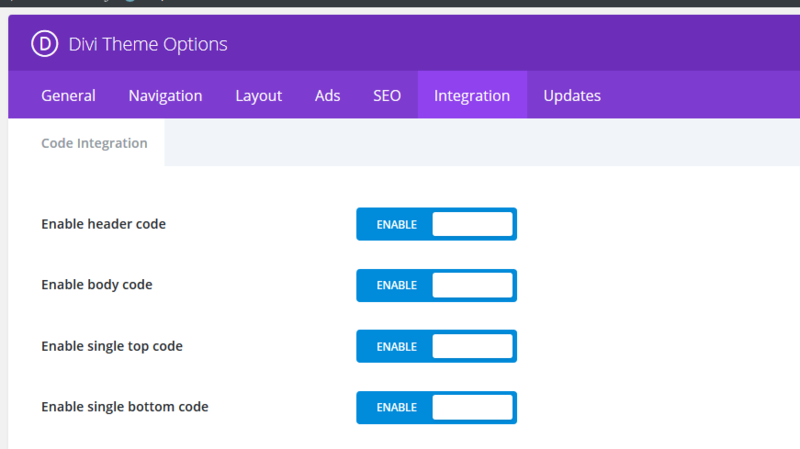 This plugin, Insert Headers and Footers, lets you easily insert code into your header or footer, so connecting Google AdSense to your wesbite will be an absolute breeze! 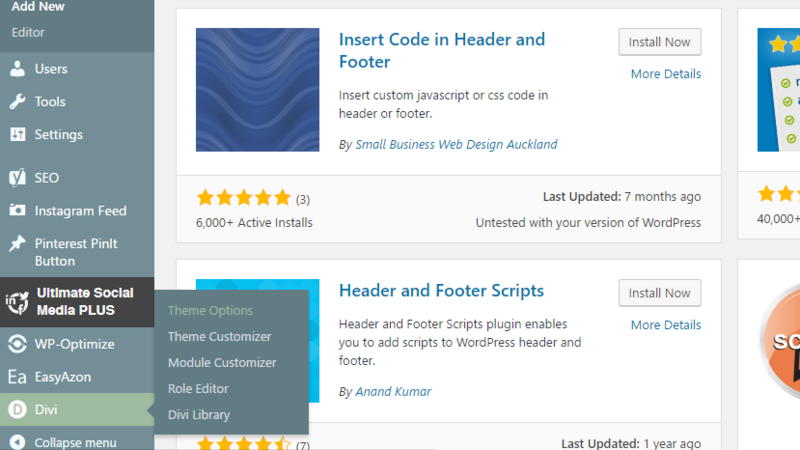 First go to your WordPress dashboard, hover over plugins, and click on add new plugin. 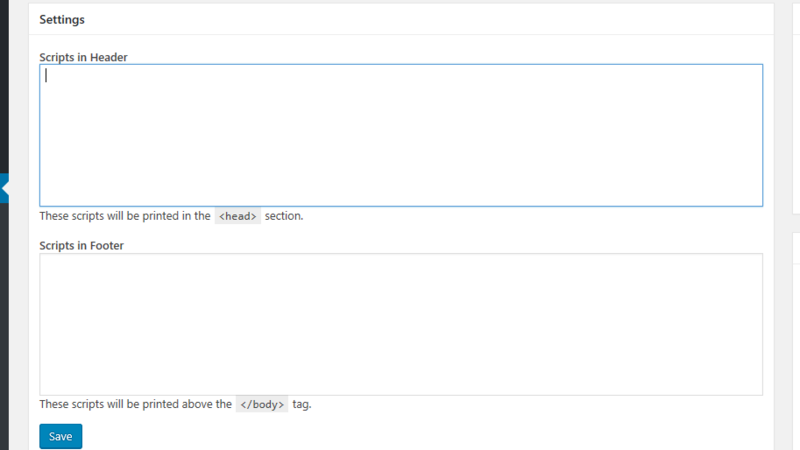 In the search bar type “insert header” and it should be the first option in the list. Provided a picture below for reference. 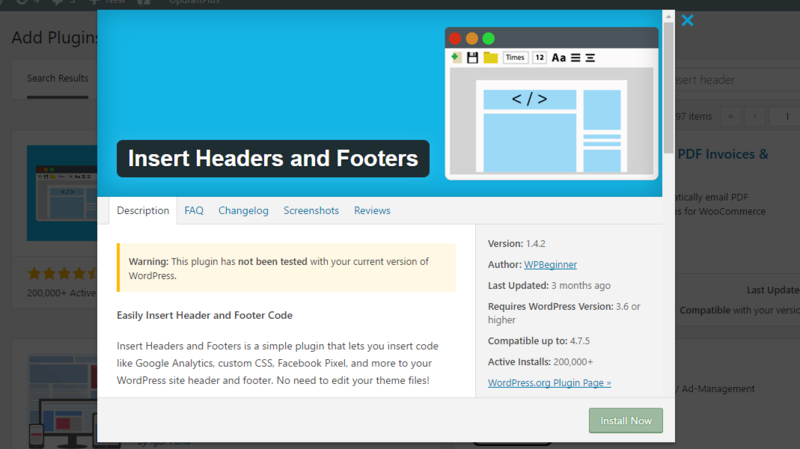 Once the plugin is installed and activated then you can find it in your dashboard under settings, listed as Insert Headers and Footers. Click on it and you’ll see a page similar to the one shown below. Lastly you’ll just need to copy the code provided to you by Google AdSense, paste it into the first box for scripts in the header, and hit save. You’re done! On the page where the Google AdSense Setup is still open you’ll just need to check the box and click done. The other method I’ll talk about is theme integration. Depending on the theme you’re using for your website, you may have the option of easily inserting code into the header, footer, and other areas of your website right from their settings. I use the Divi theme and am able to integrate code right from the Divi options. If your theme has a similar feature then I’d recommend this method. First you’ll just need to head over to your theme options. After you’ve clicked on it, you’ll go over to the top tab that says integration. You’ll want to ensure that the option to enable header code is on. Lastly you’ll copy the code that AdSense provided and copy it right into the section that says “add code to the “head” of your blog”. Once it’s added hit save changes and return to your AdSense application. Check the box, click done and you’re finished. They’ll let you know soon whether or not your account is approved and if you’re ready to start implementing ads! 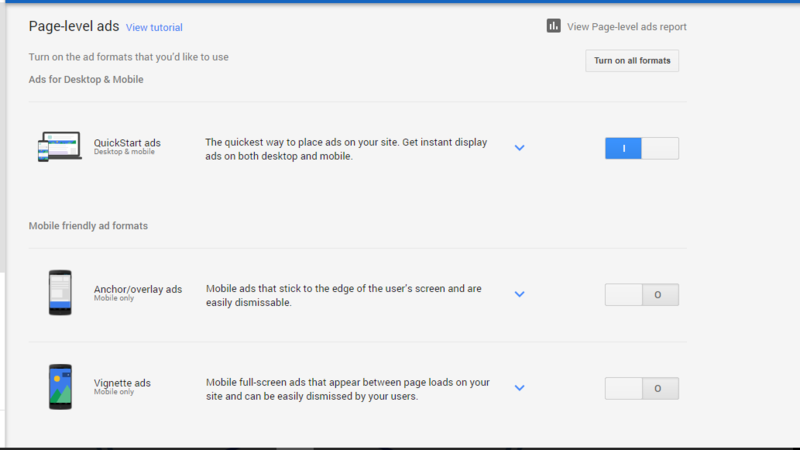 There are a few ways to customize the ads that Google AdSense will display on your site. 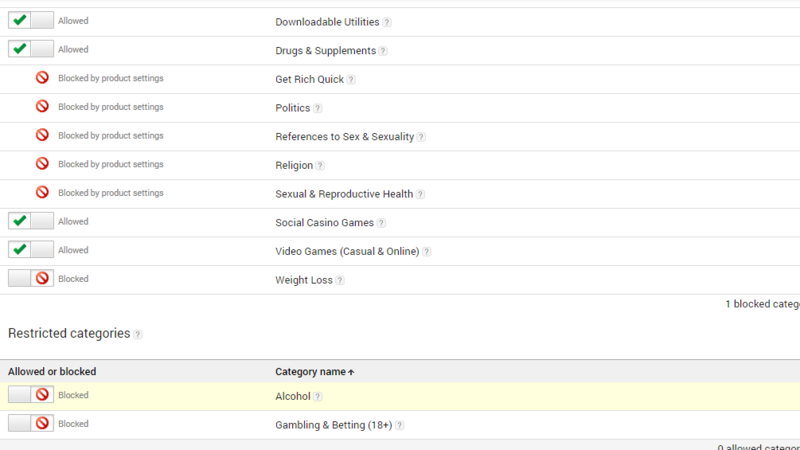 As far as content that you’d like to allow or disallow on your site, AdSense has this nifty section where you can choose to turn certain categories on or off. Things like drugs and supplement, real estate, and fashion are just a few of the categories available. You also have the option of creating a custom ad unit. They have different sizes you can choose from but I think responsive is best as it will adapt to its location. My aboslute FAVORITE feature here is the ability to customize the colors featured in this ad. That’s right! You can incorporate the color theme from your website making the ads seem like they are really a parto f your website. I feel like this helps to ensure that your visitors won’t see them as offputting or out of place. This is the quickest and easiest way to get the ads integrated on your site. The customizations options here are essentially limited to the formats you see in the picture to the left. You don’t get to pick the color scheme but it does get nice, responsive ads up on your site. I plan on making another post soon showing how AdSense looks integrated into your, and the best places to put them so you can visually see the difference between sidebar ads, in page ads, and ads placed in headers and footers. If you’re interested in that, and even more awesome content, then subscribe below to never miss an update! 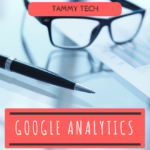 I hope this post has been helpful to the start of your AdSense journey! If you have any special tips or tricks you use for AdSense, let me know below!